Amber essential oil is made from fossilized tree resin. Amber has been used and highly praised within healing medicine since the Stone Age, or Neolithic times. In ancient China, amber was burned during large festivities. When heated under the right conditions, it produces amber oil. Although amber gemstones have their place as jewelry, there are also many purported amber essential oil benefits and uses for health and well-being. Some of the amber oil uses and benefits include aiding with sleep, calming the mind, promoting heart health, and enhancing one’s scent as a natural perfume. In this article, we will examine the many amber essential oil benefits, find out how to make amber oil and which essential oils blend well with it, and also provide an amber essential oil recipe. Many claim amber oil has “magical properties” that make it so beneficial for health and wellness. For instance, it is known to support meditation and spirituality due to its grounding properties. Amber essential oil is also thought to protect the heart, calm the mind, stimulate libido, increase circulation, boost brain health, strengthen immunity, relieve pain, and much more. Read on to learn about the many amber essential oil benefits and uses in further detail. Anxiety, worry, and stress are often experienced together. Amber essential oil is among the oils that have a sedative effect that calms the brain. One study found that fragrances like amber can help reduce stress and anxiety by benefitting the olfactory and limbic systems of the brain that influence emotions. In general, experts recommend seven to eight hours of sleep per night; however, most people don’t come anywhere near that number. As a result, insomnia is one of the top health problems in the U.S. Essential oils like amber oil can help you sleep and make you feel calmer and more relaxed. Adding amber oil to a blend with other sedative oils like lavender or frankincense will help you get a sound sleep. Amber essential oil is also considered useful for skin problems, including eczema and acne. It reduces inflammation and clears the pores in your skin. The succinic acid in amber is also known to have antioxidant properties, and this can help fight against skin damage. For your skin health, amber essential oil can be added to your regular moisturizer or bath water. You can also benefit from a facial steam by adding a few drops of amber oil to a bowl of hot water. For hair problems like thinning hair or dandruff, simply add a few drops of amber oil to your scalp. Alzheimer’s disease is a progressive brain disorder characterized by memory loss, mood swings, depression, loss of judgment, and confusion. The antioxidant compounds in amber oil are known to improve cognition and concentration, and this may prevent long-term problems like Alzheimer’s disease and dementia. Try diffusing the oil alone or in a blend with lavender, bergamot, and ylang ylang oils. Amber oil is also considered quite effective for reducing pain and inflammation due to its antispasmodic and anti-inflammatory properties. As a result, amber essential oil could potentially benefit many forms of pain, including digestive issues, arthritis, and other forms of muscle or nerve pain. To reduce pain, apply an amber oil blend to your affected area. Amber essential oil also boosts the immune system due to its antibacterial and expectorant properties. Consequently, amber oil can help treat chest congestion; infections; and symptoms of the common cold, flu, bronchitis, and asthma. It does this by breaking down mucus in your lungs and fighting off bacteria and other pathogens that make you susceptible to disease. For respiratory problems, simply massage the amber oil diluted with carrier oil onto your chest, or inhale the oil in a hot water steam while covering your head with a towel. Heart disease is the leading cause of death in the U.S. The antispasmoic nature of amber oil is able to improve cardiovascular function and blood circulation, lower oxidative stress in the heart, and strengthen blood vessels. As a result, amber essential oil may help reduce your risk of heart attack, stroke, angina, and heart palpitations. Traditional Chinese medicine (TCM) practitioners have even used amber to prevent coronary heart disease—a disease that impairs blood flow to the arteries of the heart. The succinic acid in amber oil is also thought to prevent problems with the heart rhythm. Amber essential oil has long been known as an effective aphrodisiac for many. This is because the oil stimulates hormones and promotes blood circulation, which leads to higher sexual stimulation. That being said, this effect is thought to be somewhat subjective since the scent of amber may not be appealing to everyone. To test out the aphrodisiac effects of amber oil, simply apply a few drops to your forearm and neck. The analgesic and electrostatic properties of amber essential oil are also very good at accelerating the wound-healing process. It relieves the pain of wounds and reduces inflammation. To use amber oil for wound healing and bruises, simply add a few drops to the affected area. Use amber oil until wounds have completely healed. Epilepsy is a chronic disease that leads to recurrent and unprovoked seizures. Some signs that a seizure may be starting include vision loss or blurry vision, anxiousness, headaches, unusual thoughts and feelings, numbness and tingling, nausea and upset stomach, dizziness and lightheadedness, and changes in your experience such as tastes, sights, or sounds. Amber essential oil is considered effective at reducing the severity of epilepsy symptoms. This is thought to be due to amber oil’s calming ability to reduce stress and anxiety. What Does Amber Essential Oil Blend With? Amber oil has a warm, sweet, smoky, and woody smell that makes it a great perfume. There is also a hint of floral citrus. To make this famous amber scent, in addition to amber, other resins are often part of this blended perfume. Amber essential oil blends well with labdanum, benzoin, vetiver, sandalwood, patchouli, frankincense, copal, myrrh, cedarwood, spruce, pine, geranium, galbanum, cypress, aniseed, clove, orange, lemon, rose absolute, and cistus oils. In this section, we will show you how to make amber oil in a blend. The following recipe demonstrates how to turn amber resin into an essential oil blend. Crumble a couple pieces of amber resin into a small glass bottle. With a small funnel, add enough sweet almond oil or grapeseed oil to fill the bottle. Put on a lid, shake the bottle, and let it sit for about a week so the blend becomes stable. The following is an essential oil perfume recipe with amber oil. Combine the ingredients in a glass bottle and let the perfume mature for three weeks. The scent becomes stable over time. The following are a number ways you can use amber essential oil. Diffuse: Add a few drops of amber oil to a diffuser to promote sleep and relaxation. Steam bath: Add a few drops to a bowl or sink of hot water and inhale for respiratory issues. Massage blend: For topical use, you can dilute amber oil with a carrier oil to create a massage blend. Common carrier oils include sweet almond oil, coconut oil, and jojoba oil. 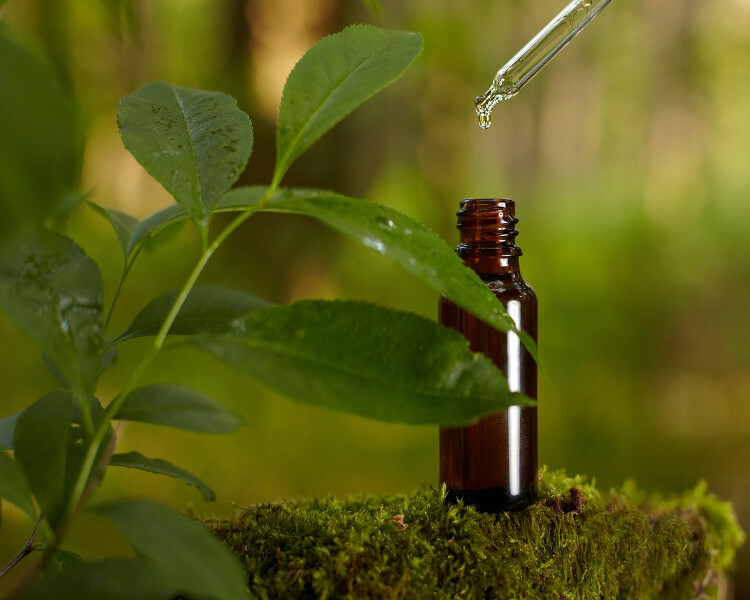 Some people are sensitive to certain essential oils; therefore, a skin patch test will help test your reaction to amber essential oil before you use it on other areas of the body. Warm bath: Add a few drops to a warm bath to soothe inflammation or pain. Amber oil is a valuable essential oil made from fossilized tree resin with many amazing potential health benefits. It is said to reduce stress and anxiety, benefit skin and hair health, lower pain and inflammation, improve cognition, boost immunity, strengthen heart health, increase libido, and more. However, it is important to keep certain precautions in mind with amber essential oil. For example, pregnant women and children should consult their health practitioner before using any essential oil. Also, remember to dilute amber essential oil with a carrier oil before applying it to your skin. Internal consumption of amber oil is not recommended, and possible adverse effects include nausea, vomiting, and stomach upset. If you do consume this oil, it must be in very small amounts and mixed with a beverage or carrier oil to dilute it. “10 Wonderful Benefits & Uses of Amber Essential Oil,” Organic Facts; https://www.organicfacts.net/health-benefits/essential-oils/amber-essential-oil.html, last accessed June 28, 2018. “8 Amazing Uses for Amber Essential Oil,” Healthy Focus; https://healthyfocus.org/7-uses-for-amber-essential-oil/, last accessed June 28, 2018. “Health Benefits of Amber Oil,” The Research Pedia; http://www.theresearchpedia.com/health/aromatherapy/health-benefits-of-amber-oil, last accessed June 28, 2018. King, J.R., et al., “Anxiety reduction using fragrances,” Perfumery, 1988, 147-165; doi: 10.1007/978-94-017-2558-3_8.